Wernddu Golf Club01873 856223work Golf - 18 holeWernddu Golf Club is situated just 1 mile out of Abergavenny on the B4521. It is set in one of the most picturesque positions of Abergavenny with views of the Black mountains and Usk valley at every angle. It is a family business run by three generations of the Watkins’! The 18 hole, par 69, south facing parkland golf course boasts a long front nine and shorter back nine providing a challenging round of golf for golfers of all standards. The club house has a lounge and bar area with a friendly atmosphere, where real ales and bar snacks are available, a warm welcome awaits all! There is also a conservatory room which is available to our members for private functions. Other facilities of the club include a ‘fun for all’ 9 hole pitch and putt, and a 22 bay floodlit Driving range where you can practice that swing, 34 balls for just £1! Adjacent to the golf club is an exclusively ‘adult only’ caravan park with an ultra modern toilet block and large fully serviced hard standing pitches, which provide an idyllic resting place for visitors to the area, all campers to the site benefit from exclusive use of our fishing pond and half price green fees on the golf course. 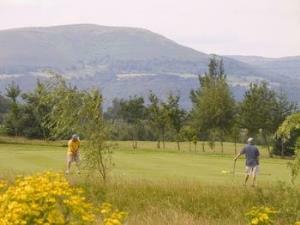 Wernddu Golf Club is situated just 1 mile out of Abergavenny on the B4521. It is set in one of the most picturesque positions of Abergavenny with views of the Black mountains and Usk valley at every angle. It is a family business run by three generations of the Watkins’! The course is built on the original farmland, which has south facing slopes, and well drained soil. The layout of the course has utilized the existing contours of the ground, and supplemented by several ponds which are also utilized for irrigation purposes. Over 20,000 trees were planted at the inception of the course, and these have matured magnificently, and their autumn colours are spectacular. The situation of Wernddu is on the rising ground to the east of Abergavenny, thus providing magnificent views over the Town and the Usk River Valley. The town itself is surrounded by the Seven Hills, and the final outcome is breathtaking.